Last year Dave was involved in that making of a documentary, “A Day in the Life of Earth”. This PowerPoint presentation is about his trip to California for shooting his segment of the film, what was involved in creating the segment, how much time it took to film, and the little adventures he had along the way. “A Day in the Life of Earth” may appear in the USA on PBS, National Geographic Channel or other science-based networks. 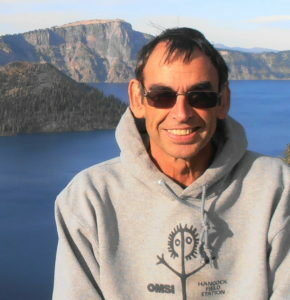 Dave Powell is a past director of the Oregon Star Party and current member of the Oregon Star Party Committee. Dave has been your “Night Sky” tour guide for many years at OSP, pointing out constellations and wonders of the night sky, telling stories from Mythology and will even throw in some science. He also volunteers at the Oregon Museum of Science and Industry’s (OMSI) Hancock Field Station during their science camps and outdoor school. Dave has earned several of the Astronomical League’s observing awards and also received the Astronomical Leagues, Master Outreach Award. Over the years Dave has made informative and entertaining presentations at the Oregon Star Party and at various astronomy clubs and other events in the Pacific Northwest. Dave earned his Bachelor’s of Science degree in Psychology in 1975 from Portland State University, has two grown children and currently lives in Ashland, Oregon, where he also volunteers for the Oregon Shakespeare Festival.